How to add a failover link to maximise uptime for your business. Does your business demand maximum uptime? Many industries find internet outages catastrophic. If you rely in VoIP telephony, SaaS systems or cloud storage, downtime can severely impact productivity and even your reputation. According to Dunn & Bradstreet, 59% of Fortune 500 companies experience a minimum of 1.6 hours of downtime per week. For large enterprises, this can run in to losses of millions over the course of a year. Even for a smaller business with as few as ten employees, this can cost tens of thousands. Businesses that need reliable connectivity are turning to internet failover links to mitigate these critical risks. What is an internet failover link? An internet failover link is a secondary internet connection. It is setup to ensure you don’t lose valuable uptime in your service. Relying on one connection is a risky approach. Spreading that risk across a secondary connection gives you peace of mind, helps your colleagues remain productive and your customers receiving the services and products they need. To achieve the best results, you need to apply the redundancy concept. This means moving away from over reliance on any one technology --in this case, your singular internet connection. A typical scenario might be a fibre link as your main connection and a wireless connection as your backup. 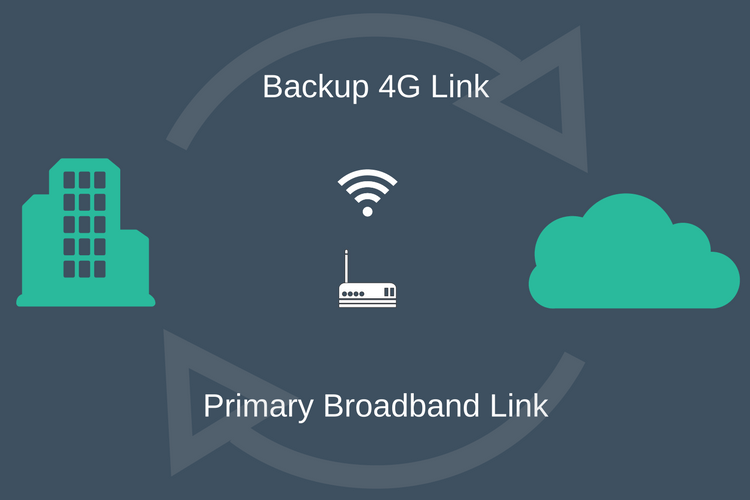 Implemented correctly, a failover solution will automatically switch from your primary connection to your secondary link. A successful failover process instantly transfers tasks from a failed system (in this case your internet service) to a similar or redundant system, in order to avoid costly interruptions. An automated failover system has the ability to quickly reroute data and communications to minimize business disruption. Some businesses might find that a basic DSL line is ample in order to maintain business activity for short outages, however, with fiber optic and other connection types being so much more affordable these days, many are opting for a high-speed option as their backup. Some businesses choose to use different connection types from the same ISP. Other companies may choose to use the same, or different types across two or more ISPs.The latter has the advantage of protecting you should one ISP have issues across all their services. When you are shopping around for the right failover model for your business, be sure to ask about reliability, uptime, fix times and support availability. Scrimping on the cost of installing your internet service can prove a false economy if you don’t get the reliability you need to remain productive and available to your customers.